Act 2 of The Springfield Jobs hit this past Friday, what’s your take on Act 2 so far? Any design plans for all the England stuff? How’d you fare with Act 1? Collect all the prizes? Work out your Italian designs? How about the rest of your weekend? Anything fun and exciting going on? So most of us have Guy Incognito as an NPC, Has anyone bought the Nag and Weasel and gotten the full-playable character? Isn’t it a bit odd to have two of the same character in the game? I think it”s pretty silly. Does it upgrade the NPC to full-playable character? That would be almost worth it. Full playable. Available for Heists. My mistake. He looks A LOT like Evil Homer. Anyone else notice that the religious folks (pope, reverends) get something to ride around on town (Pope-mobile, golf cart, train)? That’s never indicated in the store… never has been. If you didn’t use Google or a site like this it would be through trial and error only. Well, that certainly explains why I can’t find it! 😉 I just assumed it was listed somewhere obvious, and I was the only one who couldn’t find it. Thanks for the clarification! Is there much chance we’ll eventually be able to sell excess monorail tracks. I have far too many, could do with a clear out. Unlikely….. I would like to sell a majority of the items in inventory. At least there is no limit for storage. Logged into the interweb today and was overwhelmed with articles blasting the Simpsons over Apu and their response to the criticism in Sunday’s show. Don’t know if this is the appropriate place to discuss it, but the articles really cheesed me off. 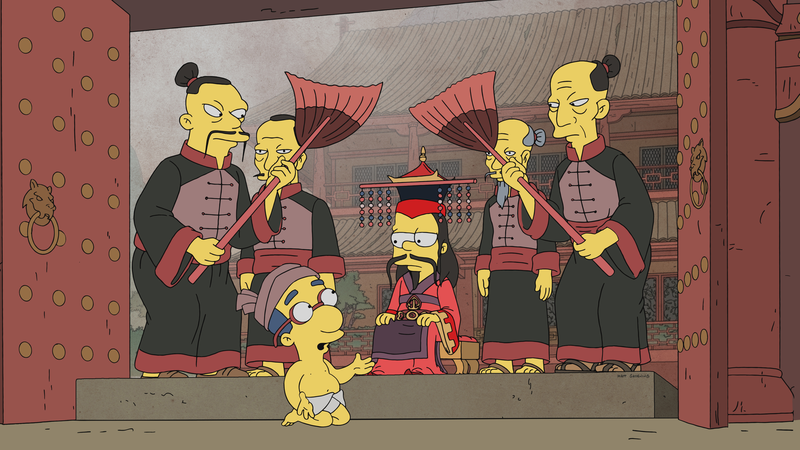 The Simpsons have a long history of skewing everyone, and I’m fine with that. What I’m sick of is people who spend their lives looking for new ways to be offended. Is it any worse then Cletus, et.al.? They are exaggerated stereotypes. I’d would suggest “Say No to PC in TSTO”. They were all worried about you MAB ! Better late than never. Hope you are relaxing. 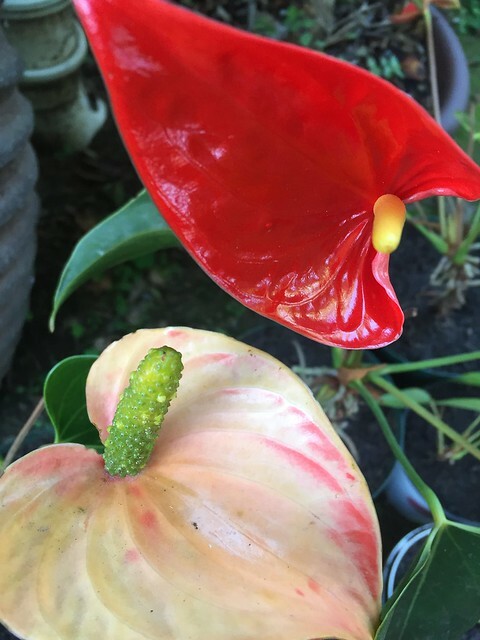 Wow…really rare to get a variegated and true red anthurium from the same plant..soooo pretty. We missed you muchly yesterday, but now…alls right with the world👍☺️. I can now breathe a sigh of relief! Got hit with another rollback incident last night… Still have my Phase 2 progress but am now unable to craft Phase 2 items because it thinks I’m still in Phase 1. I’d make a second Phase 1 land token if I thought it was worth the risk… Come on EA, this isn’t fun! I have the same issue. I just got hit by it today. I said it in another post but I’m not officially done with this game and EA. EA, I hope and wish that you would burn… but I, sadly, know it won’t happen. So the question is, will EA put the resources forward to fix the Rollback problems or allow them to grow and eventually overwhelm a critical mass of users such that this game dies from neglect? I’m now more interested in how the Rollback plays out than in the game itself. I got hit by the Rollback in the middle of Act 1 of this event. Like nbb359, it then stopped allowing me to craft Act 2 items even though I’ve already crafted some. Now it says I’m still in Act 1 even as I continue to build up points in Act 2. On top of that are all the strange partially undone things that the Rollback has produced, including no longer being able to earn monorail track and doughnuts. Seeing how completely screwed up their programming becomes is now the only reason to play. EA’s pathetic performance and response is astonishing. I had my game rolled back the other day in an attempt to fix the locked crafting glitch and it didn’t work. Now EA are referring it to their specialists just like the main rollback glitch which probably means nothing will be done. I saw your post about El Chemistri on the Turbo Tappin’ thread and I’ll offer a suggestion for how to make it more interesting without having to rely on decorating it. El Chemistri has a great animation; the doors open and close and the windows light up in cool colors. If you have Jay (he was a limited release character from 2016) he has a 12 hour task there – Taste Test Tube Tahini Tofu. But Wise Guy could animate it too. Asia de Cuba looks good next to El Chemistri, especially when it’s animated. It has a very cool animation – the whole building is lighted up in a warm yellow tone. Legs and Louie each have a 3 hour task there – Conduct Private Business in Public. When I click on the photo it says the page isn’t found. I don’t have a Flickr account and I wondered if there was another way to see them. I love your designs. Thanks. You’re talking about the water picture up above, right? When I tap it, I go right to the flickr album page. I do have an acct, tho, so maybe that’s it. Your designs are fantastic! Really enjoyed flicking through your album and getting some ideas for my Springfield. Now that I have used all of my land, I am taking the opportunity to remove unnecessary buildings and re-design areas a bit more like you have. 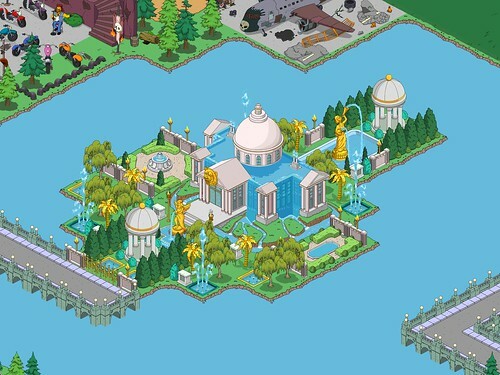 Your use of fountains and plants to form luxurious gardens is probably my favourite aspect of your Springfield. 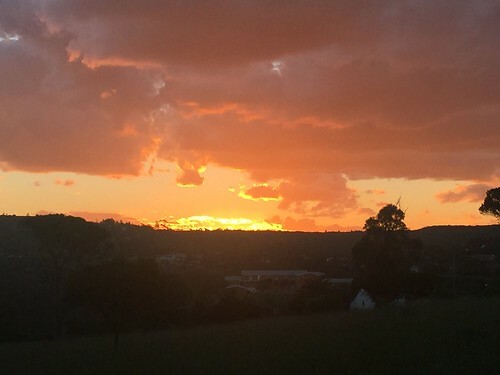 Hopefully you are able to keep sharing new ideas like this in the future – thanks for sharing! As long as my prize is “no more item limits”…I’m cut off again, hit the 10,900 piece ceiling…sigh…☹️. The Gill deal “about time travel and Jack the ripper” had me hoping EA had fixed the glitch. No joy. Such great new content BUT I am unwilling to risk buying things with my donuts that I might lose IF they do a rollback not too mention spending more real cash as my railyard wont make donuts. I NEVER had problems with my game till I spent REAL world $money$ for the donut/character deal. Now my railyard not only is unable to produce donuts with constant grinding but “says it will reset on Tuesday” but lies! Not too mention the left character button is broke, my friends level, irs radius, redwood tree and money pile that I worked so long and hard on are back to level 1. No next new EA tech IT IS NOT MY DEVISE as I play the same game on a kindle And my phone. It appears they have a virus worming its way thru their servers corupting accounts while everyone runs in circles. Two questions…Are you tapping the Nightmare pile and then choosing Shauna from the drop-down list? Or…Is there a quest for Shauna that is still showing in the task list on the left? If she hasn’t finished the quest, she won’t show up at the Pile and the Pile is the only way to send her on this job. Her costume task won’t show up when you just tap her. Last idea…store the pile and Shauna, close the game, do a hard close on your device. Resart, reopen and pull them out. Had to do that to get the quest for the mobsters to trigger in the last act. Good luck☺️. Finally have my monorail in a full loop! mainly around the outside of town, though it had to wind through a couple of streets. Tracks didn’t meet up at first. Tried a few things. Finally saw Patric’s post on the issue. Moved a tunnel along a bit & voilà. Now the long task of replacing all the little pieces with the longer pieces. I’ve only been playing for a year, so forgive my bringing up a topic I’m sure people are bored to death of…but is there any hope of getting someone like Tress MacNeille in the game? I started playing the Family Guy game later last year, & was amazed how many characters are voiced. Even the characters from Rocky! Soo few TSTO women have a voice (nearly crapped my pants when the Wiccans spoke). Tress would give a voice to so many of them.